What is your product number, the first one listed was the CW, #1289449. I wish I knew it. There’s no such thing on the iPhone app of Banggood. Just the order number can be found in my order history. Even the product description will not indicate any product ID. The CW and NW have seperate listings on Banggood. It will say CW or NW in the name. These are links from the app, but I think they will open in a browser. Those that have already ordered and would now prefer NW, you may have to contact Banggood and have them change it. Normally you would just cancel the order and reorder the other one, but since there are special prices involved that may not be a good idea. I’m sure Freeme will give advice. My order history on the iPhone app only shows the short description without “CW” or “NW”. If I click on the item it will open up the CW version. It’s just a bit confusing right now. I don’t mean to point my finger at anyone or rush anything for clarification here since despatch will not start before mid of June 2018. It’s just that I could image that I am not the only one who is curious about the version that was ordered before there were two different versions to choose from. Most probably my confusion is a result of the missing information about the product ID in the Banggood app. So, if there was anything to blame on, it may be on the smartphone app. I will post a form for those wish to change their order from CW to NW. Banggood rep will then get CS to proceed the update. Form will be up in 30mins. The CFT-90 is 3mm2 compared to Cree xhp35-HI at 2.35mm2. Minor correction, CFT-90 is (3mm)² and xhp35-HI is (2.35mm)². Or otherwise 9mm² and 5.5225 mm². Though the latter was measured by Koef3 to be actually 5.32 mm². Do you know if these will be using the same emitters as the MF02, CW 6500k and NW 4000k-4500k? I thought that is what I wrote. Did I type it wrong? I was trying to say xhp35-HI is 2.35mm x 2.35mm. The CFT-90 is 3mm x 3mm. I wish I could get the little 2’s, but my keyboard doesn’t have it. I use Samsung Note 4. Okay, sorry….in that case I’m unable to help. Maybe you have a button for special characters/figures on your digital keyboard? Or maybe if you longpress “2” it might show up to choose ².
I confirm the expected despatch date has been moved to July 2018. Submitted the request too for changing from CW to NW. I changed mine too. Thanks for this option ! I also submitted a change request. Thanks for the option. 12 requests received so far. There is one entry with wrong order ID. Your supplied email is p-pi**@hotmail.com. Pm me. 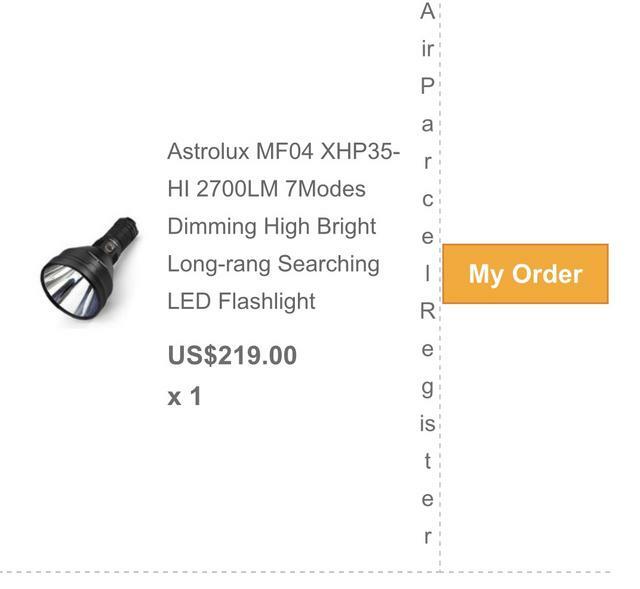 I see people ordering these lights, but I did t get a PM... And I also see people talking about a lower price all of the sudden.... Is this even a group buy?????? Will the neutral option have any influence on shipping date? I have a concern. I placed my ordered on the first day. How do banggood know which tint I ordered?? My order didn’t mention CW or NW. Nevermind,, i log in to bangggood.com under my preorders.. it say CW..